Aurora Healthcare Communications has expanded its team with the appointments of Claire Mosley, Kristen Barrett and Joe Balfour. 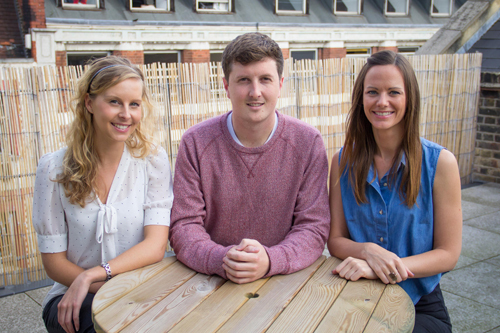 Mosley (pictured above right) joins the London agency as senior account director and arrives from Tonic Life Communications, where she worked across a number of therapeutic areas including rheumatology, respiratory and cardiovascular disease. Barrett (above left) takes up a post as an account manager and moves to Aurora from Atlantis Healthcare where she managed the organisation's marketing communications initiatives. Meanwhile, Balfour has been appointed account coordinator and – following his initial healthcare forays through lab-based medical research and pharma recruitment - will be contributing to Aurora's delivery of media launches and educational programmes. Claire Eldridge, managing director and owner of Aurora, said: “We're all very excited to have Claire, Kristen and Joe joining Aurora. Their personalities, experience and skill sets will expand our talent pool and contribute to Aurora's unique approach to servicing clients.